Interview With Brett Morgen, Director Of 'Kurt Cobain: Montage Of Heck' "The idea was not to tear him down, nor was it to put him on a pedestal," says director Brett Morgen. Instead, executive producer Frances Bean Cobain told Morgen to "make it honest." Kurt Cobain with daughter Frances. Ever since his death on April 5, 1994, Kurt Cobain's life story has become the stuff of myth — a happy-go-lucky kid traumatized by his parents' divorce; a tortured-genius teenager turned a brilliant, disturbed musician; a drug addict who took his own life. It's a narrative that perpetuates itself partly because of the power it holds in the songs Cobain wrote for Nirvana. But a new HBO documentary, Kurt Cobain: Montage of Heck, looks beyond that well-known story. It gives motion to Cobain's artwork and photographs, and spends time with his media-averse family. And it's a film that is, at times, hard to watch. 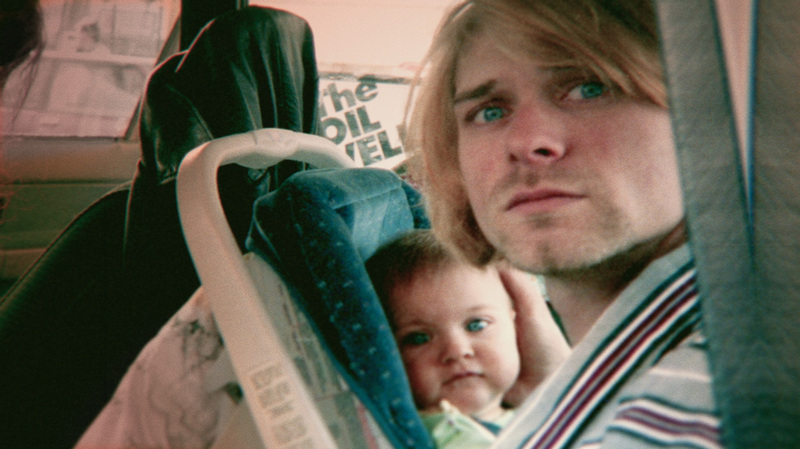 It makes sense when you know that executive producer Frances Bean Cobain, Kurt's daughter, gave director Brett Morgen the dictate, "Keep it real and make it honest." "The idea was not to tear him down, nor was it to put him on a pedestal," Morgen tells NPR's Rachel Martin. At the audio link above and in the extended conversation below, Morgen talks about hearing tape of Kurt Cobain recounting an attempted suicide as a teenager, the musician's complicated relationship with Courtney Love and how the family reacted to footage of Cobain's drug use. So this is a pretty amazing project, because you were given access to all of these family archives. You've got family films from when Kurt was young, personal audio diaries from him and video that captures these really intimate moments between Kurt and Courtney Love and his daughter. First off, how did all of this come to you? Why were you the guy who got access to this stuff? Why was I the chosen one? I had done a movie called The Kid Stays In The Picture about the legendary Hollywood producer Robert Evans, and the movie was narrated by Bob and told using his photographs that we had brought to life through some visual effects. Courtney Love had seen this film and was a big fan of the way I was able to animate the photographs, and so she came to me and said, "The world knows Kurt from Nirvana, but in our storage unit, we have a ton of art, and I think that you might be the guy to do some interesting things with it." And that was in 2007, and I spent the next five years trying to sort of wrangle all the rights together that would be necessary to make the film, and around that time, I was five years into it, things had changed. Courtney's daughter Frances had come of age and was now equally in control of the estate. A meeting was set up for me to present Frances with my idea of the movie, and I went to Frances' house. She opened the door and she greeted me and we shook hands, and she said, "You know, I just met you, but I know you more than I know my father." And what she meant by that was, Kurt died when she 20 months old, and she had no active memory of her dad, and that was really touching, and that will figure into this narrative in a moment. And we sat down, and before I could get a word out, she pitched me what she thought her idea of the film was. And she said, "Listen, whatever you do, keep it real and make it honest. That's the best tribute we can do for Kurt." She said, "Wherever I go in the world, people say, 'Oh my God, your dad is so cool and he's like Santa Claus,' and I think that Kurt was about honesty, and let's make an honest film." That was the dictate. I then embarked on this journey and eventually the family all came together sort of around Frances, meaning Kurt's mother and father and sister. This was the first time his mother, father and sister had ever participated in a project of this kind. In fact it's the first time they were ever interviewed on camera in their lives, which is extraordinary. They were all willing from the beginning? They didn't have any apprehensions about this? Once Frances was on board, everybody came together. And you know one of the things that's amazing about this when you think about it is you had mentioned the childhood home movies, so Wendy Cobain [Kurt's mother] had kept these pristine Super 8 movies of Kurt growing up from about 6 months to 8 years. It's amazing because it's like Boyhood -- you see Kurt Cobain grow up before your eyes, and what's extraordinary about that is Kurt's childhood is so deeply tied in to his mythology, and so for the last 20 years, we've had several biographers attempting to put Kurt's story together, whether it's in a book or an article or a film. But none of them had access to this material or to the mother, father and sister together. What was, for those that don't know, the popular mythology — that this was a really troubled guy for a very long time? And what you're showing is that actually, for a few years when he was very young he was this happy kid? Well, not exactly. Kurt used to say that he had a happy childhood until his parents divorced, and that was sort of the central myth that he helped propagate and has been sort of written about him. But 20 minutes into screening the footage, I realized that, at least from what I can see, that wasn't entirely the case — that I saw a child who was adored and loved by many when he was a baby. He was part of a large extended family, and he was the first-born child. And so all the attention moved towards Kurt, and when I say he was beautiful, I mean I've never seen another child (of course outside of my own) that was that angelic. So people were drawn to him, and then what I began to notice — and maybe I was reading too much into this — but what became slightly evident to me was as he got older, his sister was born and there were several cousins that were born, and slowly but slowly he started to disappear from the footage, and you would see him trying to get into it waving, and the camera would pan off. Jumping into a shot, and the camera would pan off. And I found it somewhat telling. Complemented by that were interviews I had done with his parents and his sister, and Wendy described problems starting around 2 1/2, 3, with his hyperactivity. And it was an age where I think all boys are hyperactive, you know? I mean, I have two boys and a girl, they're very different. And the family wasn't sure how — he had very young parents, I think 18, 20 years old when they had Kurt, and as Wendy says in the film, that was what you did back then. If you didn't go to college, you had babies. But they were still babies themselves now for all practical purposes, and so Kurt started to have problems with hyperactivity that happened right around the time his sister was born. And so they took him to a doctor, and the doctor initially prescribed Ritalin, and when that didn't prove effective, they tried sedatives, and when that didn't prove effective, they tried removing him from sugar, and depending on who you're talking to, there are a lot of sort of different attempts made to regulate Kurt's energy if you will. Don is his father? Don Cobain? Yeah. And so this idea of a happy childhood, until the parents divorced, really was put into question. "Kurt, from the moment he could hold a paintbrush in his hand, was painting. And from the moment he could hold a guitar, he was playing." Something else, though, that's even much more telling was Kurt's art. Kurt, from the moment he could hold a paintbrush in his hand, was painting. And from the moment he could hold a guitar, he was playing. And throughout his entire life, he was able to articulate his experience of life through his art, and you can see it in those first drawings when he was like 4 or 5 years old and they're Mickey Mouse, Goofy -- everybody looks really happy and they're very joyful. And then they get darker progressively, and the first thing that I noticed were pictures that started to -- there used to be a lot of them around 8 or 9, a lot of pictures of marionettes, of characters on strings, which is a theme that he would return to later in life, I think when he was dealing with his addictions. And then by 11 or 12, what was once a Norman Rockwell-esque home -- you know, family home with a white picket fence -- was suddenly on fire. I realize that we could tell the story of Kurt's experience in life in the best way that he was able to communicate it, which is his art. One thing about Kurt is before he was a musician, and before he was a rock star, he was an artist, and an artist with a capital A. What that means is that he had to create. It wasn't something that he chose to do -- it chose him. He had to kind of purge it out of him, and he would work in any medium available to him, whether that was music or audio collage, or painting, or sculpting, or doodling, or journal-writing or sound design. "Before he was a rock star, he was an artist, and an artist with a capital A. What that means is that he had to create. It wasn't something that he chose to do — it chose him." What I realized, by the time I had evaluated and gone through all the stuff in the family storage unit, was we had an opportunity to allow Kurt to tell the story in the best way he could through his art. And in a way he had left behind a visual and oral autobiography of his life, and it was just there for me to curate. So we're going to fast forward a little bit. This is a young man, he's making his art, he's using that as a mechanism to express what's happening to him emotionally. And he's having a hard time as a lot of teenagers do, but he does go to some dark psychological places, and he is documenting this as he goes — as you have said he's doing it through his art, but also he's keeping audio diaries. You include them in the film [including one clip about Cobain attempting suicide]. It's haunting to listen to this now. You've embellished with some sound effects, but this is his voice, right? This is Kurt Cobain recounting an attempted suicide. Yeah, it's amazing. I was at a Q&A the other night and someone asked me who the voice of our actor was, and I was like, "You know everything in this movie is Kurt." That tape was recorded, I believe in 1988, he had wrote the story out in a journal and then he took to a microphone to record it, and from all practical purpose, from everything I know, he threw that in a box and there it sat until 2012 when I discovered it. And it's remarkable for several reasons. I think one, here we have Kurt Cobain discussing a failed suicide attempt at the age of 14. So given what happened to him in the end that certainly would cause one to take a second look at it. He's performing the tape, so even this story becomes a work of art -- no different than a song -- and lastly, what really sort of triggered the whole sort of narrative was that last line. It's not so much that he attempted to commit suicide, but why, and after I had evaluated everything in the archive, I went back to listen to the tape, and it was then that I honed in on that: Why? "I couldn't handle the ridicule": and it was suddenly like the end of Usual Suspects where everything came into focus, because at that point I had an opportunity to see everything, and those words — guilt, shame, humiliation — sort of were illuminated everywhere. They were in songs I've sung since the '80s that I never really thought twice about, songs like "Floyd The Barber" where the chorus is, "I was shamed, I was shamed, I was shamed." And I thought about what Wendy had said to me about the divorce that Kurt was ashamed and embarrassed by the divorce. My parents separated when I was around the same age as Kurt, but I remember feeling abandoned. I never consciously felt shamed by it, and so these things started to add up. Of course Wendy had talked about Don ridiculing Kurt as a child. These things started to add up and at a certain point you just sort of look for a repetition throughout his experience to try to piece the story together. You tell the story of Kurt Cobain and Nirvana is part of it, but it's not the whole story. There's a moment in the film, you are telling the story of how this band has then exploded. It's the early '90s, and Nirvana is everywhere. He meets this woman. He meets Courtney Love and the two of them have this crazy connection. It turns out to be a fairly dysfunctional relationship, I think we can call it. Drugs were a big part of their dynamic, and they end up filming themselves a lot, which is really interesting to think back then that wasn't — now we take it for granted that everyone is filming everything, but back then that was kind of extraordinary. Kurt Cobain (left) with Courtney Love and Frances Bean in L.A., 1993. Every time they turn the camera on, they would talk about how they were filming "the movie." The reason there's not more footage is they were very confused about whether the red light meant the camera was on or off. ... Every scene started with, "The red light's on, Courtney, does that mean we're rolling?" I mean, it was just constant. But it is extraordinary because what I realize is after, you know, we looked at everything we had in Kurt's archives, and at the same time we were collecting all of the media that had been disseminated across the world during '91-94. When you compared Kurt as he appeared before the media to the Kurt Cobain that existed in the unfiltered media, you are revealing a completely different person. Even the way he spoke, the tone in his voice, the cadence were completely different. How so? What was so different? I don't think he was ever really comfortable doing interviews or being a star or having the attention put on him at that point of his life, and so he would often, and you see this in the movie, he would often be caustic, withdrawn, sarcastic, sometimes overly earnest. Kind of a nightmare interview, frankly. Well, unless you got him on a good day because when you got him going he could go, but half the time it was self-mythologizing and trying to do damage control from various negative press, and I just decided early on that I wasn't going to use Kurt's voice, his interviews, to tell the story, that I would use the art, that I would trust the art to do the story. And when else can you do that? I mean, what other subject can you think of who's documented themselves in a manner that is so well-suited for cinema because film is 50 percent sound and 50 percent image? You felt that the art was a more accurate representation of who he was, not necessarily what he was saying in interviews or in his public persona. I felt that it allowed us to arrive at an emotional truth in a much more honest and sincere way than relying upon what he said in an interview, because as we just talked about, his common line was, "I had a happy childhood, until my parents were divorced." Well, that just didn't bear out. They had a baby — Frances Bean who we talked about earlier. The footage from that time was really intimate. Do you think he liked being a dad? I think he loved being a dad. I think that he took to it like the way some men I think take to it easily and some are sort of like, "What the heck is that?" 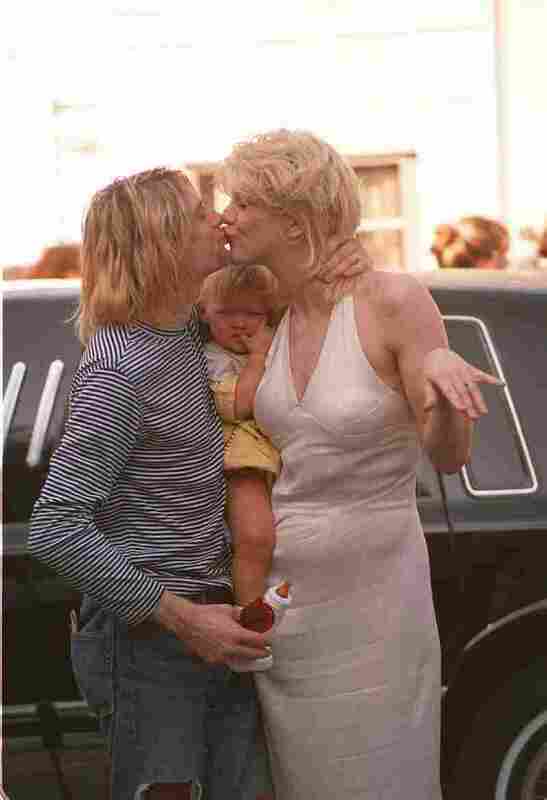 I think Kurt was without question the more maternal of the two, between him and Courtney. I mean, [once Courtney was asked] "Was Kurt a good dad?" and she said "Well, he was a great dad for a heroin addict." And I think as he was as good as a father as he could be, under the circumstances. "I think as he was as good as a father as he could be, under the circumstances." There's some footage, it's not in the movie, where he takes her -- I think it's one of the first times he had [Frances] back at his house, and it's, the take goes on for like two hours and it's just him holding her and looking her in her eyes and petting her head, and it seemed, he seemed so comfortable in that context in contrast to interviews and being on the stage and being the front man of Nirvana. How did you approach his drug use? What did you want to say about it or how did you think about it in the context of this project? Well, when I started the project. I certainly wasn't going to try to make any statement about it. That's not how I work or operate. I wasn't trying to make a social issue film. But I think in part of the idea of presenting this story in an honest way, we needed to address it. There's this scene that's been getting a lot of — people have been talking quite a bit about where Kurt and Courtney are trying to give Frances her first haircut, and Kurt is very heavily sedated. This happens very late in the film, he's got blemishes all over, he's emaciated, and he's falling asleep while he holds his daughter in his hands, and it's terrible, and it's horrific, and it's something that nobody wants to see. And when I screened the film for Kurt's mother and sister for the first time, they were horrified, as one would expect. I think Wendy Cobain would have preferred, and I don't blame her, a rose-tinted view of Kurt, maybe Saint Kurt, and was like, "Why do we need to do this to him?" But it wasn't Wendy's story to tell, it was Frances' and I was operating off her desire to tell the story in an honest way. She never blinked, but I'll share something with you. Kim Cobain, Kurt's sister, was very upset and said to me, "You know, my brother was really embarrassed about his heroin use, do you think he would want this in the film?" And I said, "You know, Kim, the one thing you've always shared with me is that Kurt's biggest fear was that he would inspire or influence kids to do heroin, and I don't think there's anything in this picture that's romanticizing it. In fact, if anything it's doing the opposite. And there's a slight chance that there may be one kid who sees this movie and as a result decides not to do heroin, and I have a feeling if your brother was here and was given the choice of saving one life or selling 100 million records, he would choose to save the one life." And sure enough at the third screening of this film at the Sundance Film Festival, a young woman came up to me in tears, shaking, and telling me that the experience of watching the film was what she needed to overcome her own battles of addiction. "The idea was not to tear him down, nor was it to put him on a pedestal. It was just simply to look him in the eye." Without that image, we're once again just propagating this myth, because everyone knows Kurt's associated with heroin, but we haven't seen the face of it. The idea was not to tear him down, nor was it to put him on a pedestal. It was just simply to look him in the eye, and I feel that when you strip away the layers of mythology to reveal and reveal the man, the man is so much more endearing and dynamic than the myth. What did you learn about his relationship with Courtney Love? She took a whole lot of flak from his fan base when Kurt was alive. Some even blamed her in some way for his death, his suicide. Well, I think one of the things the film shows is that Kurt's problems predated Courtney and they predated Frances and they predated fame and heroin and Nirvana. I think that they were attracted to each other because they were both artists, and Courtney is a strong woman. She, in many ways, reminds me a little bit of Wendy — and neither of them would like that, I don't think — but in the sense that she fills a room, and she is very opinionated, and I think Kurt liked that. Kurt was a feminist. A lot of the bashing against Courtney I think has to deal with gender bias and the media, and I think that he liked that she was taking the attention off of him. But what I saw in private were two young people in their early 20s who were very much in love with each other, and the film really challenges the viewers' image of Courtney in the sense that you're seeing her and experiencing her through Kurt's eyes in this film, not the way the media was seeing her. When you see them in that context, it's hard not to find both of them rather endearing, depending on your point of view. You didn't know him, right? You've never met Kurt Cobain? I never met Kurt Cobain, but I felt like I got to know him in a manner probably more intimate than anyone I've known outside of my family. What a strangely unique experience. I've never had access to another person's art and work or, particularly, someone who is as prolific and was able to externalize his interior world as deeply as Kurt could. What also was helpful, not knowing him — and I was in the same boat as Frances in that realm, because I think both of us were in that position where we were sort of entering it. You can't divorce yourself from your own life experiences, but short of that there weren't any myths I was going in there to debunk. If what I found was in concert with the myths then we would be having a separate conversation. "Everybody feels protective and possessive about Kurt, and I think that can be attributed to his unique gift, an ability to touch our lives, and make us feel like he's our friend." So did your perspective of him change? Absolutely. I have to say I was so in awe. I continue to this day to be in awe of his ability to connect with people. I mean, what's so sad and tragic about his story is I think in many ways Kurt felt very alone, and yet through his art he was really able to connect. ... Everybody feels protective and possessive about Kurt, and I think that can be attributed to his unique gift, an ability to touch our lives, and make us feel like he's our friend. I've heard every now and then the criticism, "Why are we still talking about him? He was a druggie who did three albums." No, that is not true. He is a man who has brought comfort to generations of people all over the world. It's almost like a rite of passage when you turn 12 and 13 and you look at your parents with different eyes. You have Kurt, and he's singing about your experiences. They're our collective experiences. And I think that is why we're sitting here talking about him today.